ND Brown are specialists in grab hire in London. We supply grab hire vehicles across all London Boroughs and the South East of England. Whatever your project, we have the grab hire lorry for your requirements. For construction projects which are large and small in the capital, we have the solution for grab hire in London. With a dedication to the highest standards of vehicle safety, you can be confident that you will get all the features to enable you to get the job completed efficiently and safely. 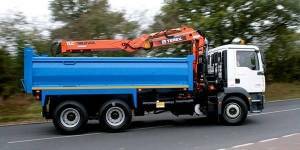 The 7.5 tonne grab truck is our lightest and most agile vehicle. It is perfect for smaller projects or for accessing smaller streets and construction sites. The drop sides make it a versatile lorry for delivering materials or removing non hazardous waste off site. When you need a bigger capacity vehicle, our 26 tonne grab hire has a payload of approximately 12 tonnes. Fitted with stand up controls and either Atlas Epsilon or HMF cranes it is a perfect “muckaway” vehicle. For the large scale removal of soil, rubble or concrete, the 32 tonne is the biggest 8 wheel grab hire at your disposal. All our lorries used for grab hire in London, are fitted with safety features like a beacon bar and full chapter 8 chevrons and more. If you are looking for an efficient self-drive service for grab hire in London, get in touch with ND Brown. From our location in Tonbridge, Kent, we can provide you with grab hire vehicles across London and the South East. With long and short term hire solutions, our delivery and collection service will keep your project scheduled for success! Contact us to organise your grab hire in London or call 01902 791 991.